Music professor Ashley Fure, a composer of acoustic and electroacoustic music, recently added the Rome Prize to her list of impressive accolades in this year alone. Recently, she received a Guggenheim Fellowship, and her composition “Bound to the Bow” was a Pulitzer Prize finalist. Fure, who holds a Ph.D. in music composition from Harvard University, joined Dartmouth’s faculty in 2015. How did you first realize your talent in music? AF: It’s actually one of my earliest memories. I was 4 years old, and my parents bought this old, beat-up piano from a neighborhood church that was getting rid of it, and we were moving from the town I was born in to the town where I eventually grew up. I was the youngest in a big family, and there was lots of chaos around me and the house was being emptied. I was just kind of forlornly sitting at the piano and my dad came down the stairs and — I have this very vivid memory of it — he said, “Honey, when we get to Marquette, [Michigan,] we’re going to get you piano lessons.” And I was four, so I think he thought — he was just trying to pacify me — and he thought I would forget about it. But I didn’t, I would just not let it go when I got there. They thought I was too young, and they couldn’t really afford it, but my grandfather ended up jumping in. So I started taking piano lessons really early, and I actually just always composed. At that age, it meant improvising and memorizing and performing them at my little piano recitals. It was just always a thing I did. I never thought it was weird, I never even thought I sat down with it and was like, “Hmm, maybe I’ll be a composer.” I always did it, and I kept doing it. At some point, somebody else kind of named it for me, and they were like, “Wow, it’s really weird that you do that — maybe you should start doing that consciously,” but that was much, much later, like when I was a teenager. It was a pattern I was in. I did it consciously in the sense that I kept wanting to do it, and I kept working at it. I was taking piano lessons and my piano teachers, as I got older, started encouraging me to write down the notation and not just memorize it myself and perform it. At some point, I ended up applying to go to [Interlochen Arts Academy,] a fine arts boarding high school. I applied as a composer. That was the first time that I consciously studied it and that was my junior and senior year of high school. You joined the music department at Dartmouth in 2015. How has this affected your artistic career? AF: There are two parts of this story. I actually was in Europe for six years, and I moved back to America in 2014 to take a post-doc at Columbia [University,]then I came up to Dartmouth for this job. So the job here kind of coincided with me moving back to America and actually coincided with quite an upsurge of opportunities for me here, in addition to the professional career I had built up in Europe. So the teaching job coincided with quite a wealth of opportunities which have kept feeling like they’re too good to miss, which means that I just don’t sleep very much! It’s a lot to manage, to be present for my students and also be present for my work. The problem with my work is that, unlike the traditional humanities disciplines where you can write a couple of great books before tenure, there are two things that make it different. One is that I need to be physically present for rehearsals and for premieres, and the second is that I’m not actually as in control of the timing of these projects as my colleagues in other disciplines might be, so they call me up, and they want a string quartet, and the concert’s May 15, and that doesn’t matter if that’s in the middle of my term — a lot of those details are outside of my hands, so that makes it harder, I think, to manage being a practicing artist and being a full-time professor. 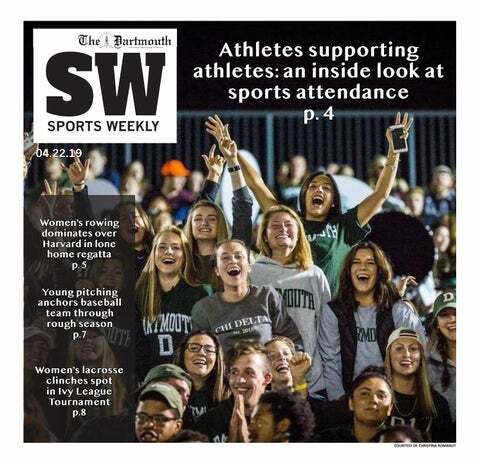 Dartmouth is great in the sense that we have a term structure — they’re intense, those terms — but our term is really helpful for doing your own work. Obviously, there is a lot of research support built in and sabbatical support, so it makes it more manageable than some other places, but I’m not going to lie — it is exhausting! Your work “The Force of Things” premiered last year in Germany in an immersive environment for the audience. How do you envision music as multidisciplinary? AF: Well, sound is just actually movement — it’s just things bumping up against other things. So if you slow a speaker down enough, the faster they bump up against them, the higher the pitches sound; the slower they bump up against each other, whether it’s air molecules or sound passing through different media, then the lower that perceived tone will sound. So, actually, if you take a speaker and you just put a tone through it that’s too low for humans to hear, you actually can see the movement of the speaker, like sound becomes sight at this threshold of audibility. In a way, sound is inherently synesthetic and inherently deals with physical movement and auditory phenomena and visual phenomena. So this project, “The Force of Things” — there aren’t any motors in it, things are kinetically moving around you, but it’s sound that’s moving everything. It’s subwoofer speaker cones that are causing all of the visual inflection and all of the auditory inflection. And just about all of the big interdisciplinary projects I’ve built are looking for that — this synesthetic mapping, where one modality is somehow read into another modality, whether it’s sight into sound or light into physical movement. I’m looking for these kind of intuitive tangled gesture relationships between all those different layers. That sounds like quite an experience! AF: Well, you should all come! “The Force of Things” premiered in Germany last summer, but the big scaled-up version is happening just outside of New York — a five-minute train ride from the city — in October, the sixth and seventh I think. You’ve recently received recognition from the Guggenheim and Pulitzer committees, and, most recently, a Rome Prize. Going forward, how do you think these fellowships will help you realize your career goals? AF: I would say a couple things. One is that it’s just an incredible gift of time and support to just focus on your work — there’s just an invaluable luxury in that, and to just have a breath away from all of the responsibilities that come with teaching. But it’s not just about the ego, it’s not about winning these to win them. What they do is that they create an infrastructure. Prizes that have recognition like that — they help you advocate for your work. Particularly, these wilder interdisciplinary projects, they actually require quite a bit of investment. They require the investment of time and resources and space, and pulling that off, you have to marshal a lot of people to believe in your work and a lot of people to offer these different kinds of support. The résumé stuff, you know, it’s never the end goal — it can’t be. It’s not how you ultimately value your own work, but what it helps to facilitate is the opportunity for you to make more work, for you to go forth and marshal these forces, so you can make what you want to make and have a chance to do so. Like I said, I was in Europe for those six years, and it’s such a different artistic infrastructure. I moved there at the end of graduate school, so all of my adult work had been really made in Europe. And the arts funding structure is wildly different than ours in the sense that it exists. And also in the sense that, in America, a lot of our arts funding is really filtered through the university system, in a way. “The Force of Things” is the first project that I’ve really had to source here in America, and we got funding — the ensemble I was working with in New York — the International Contemporary Ensemble, who is coming up for a concert on Tuesday. They’re playing a piece of mine, playing three pieces of Dartmouth students, they’re playing some iconic works. So ICE — it’s an incredible ensemble, but it’s also incredible at the business side of making works, so they know how to hustle funds. And it was really fascinating to do this ambitious project here in the states for the first time with them. So we got a big grant from Dartmouth, and it’s a collaboration with my brother, who teaches at the University of Michigan. So we got a lot of funding from them, we got a lot of funding from Siemens, which is a big German cultural funding body, we got all sorts. You kind of have to piece together all this stuff, all of which is a longwinded way of saying that this type of recognition helps that process and pulls together resources to help advocate for your work.